Harajuku girl wearing an all-red ensemble with slipon sneakers, a message necklace, and see through purse. Blonde Harajuku girl in an all black street style while walking along Omotesando Dori in Tokyo. Tokyo fashion student with her friend wearing a black denim jacket over a t-shirt, pleated skirt, knee high socks, black sneakers and a red tote bag. Japanese merchandiser showcasing a subdued kawaii street style in Harajuku. Harajuku fashion student with layered vintage tops, ruffle skirt, mid calf boots, and accessories. Harajuku girl in handmade and resale fashion with denim jacket, cropped top, satin pants, platform shoes and handmade Werner Muller record bag. 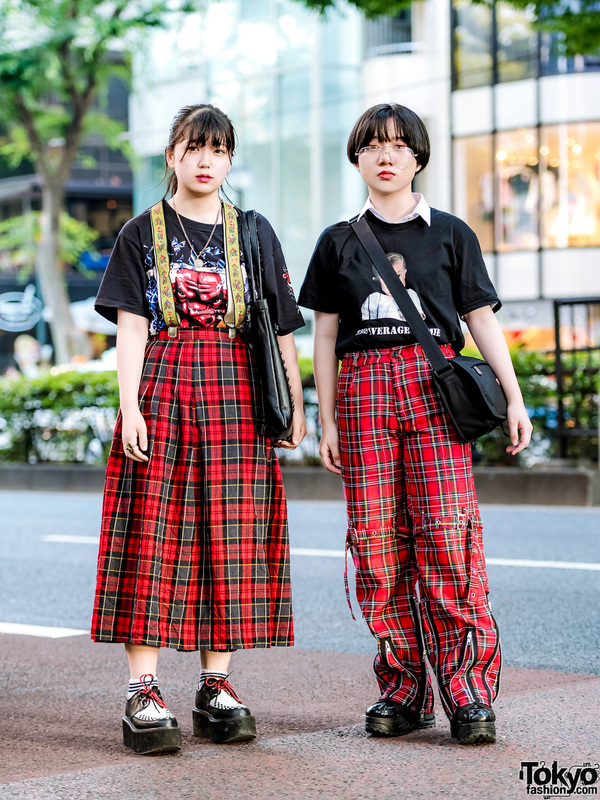 Harajuku girls in graphic street fashion w/ off-the-shoulder cropped top, cutout jeans, heeled shoes, turtleneck sweater, printed pants, platform loafers, handbags and accessories. Two Harajuku girls and one Harajuku boy wearing colorful resale fashion along with items by Jeremy Scott, EXPERTSDISAGREE, WEGO, Spinns, WC, and Dr. Martens. Harajuku girl with pink hair, oversized pink bomber jacket, ripped pink jeans, sneakers, and a canvas tote bag.